Have you seen any Sponsored Ad over Google for search term "Twitter", that too not for any website or blog site....it was to follow Twitter Profile. Great impressive to see people don't hesitate even investing money just to increase Twitter follower's count...or I can say good approach for Speaker's to build up reader's list, involve user and promote services to them. Overall Creative approach! 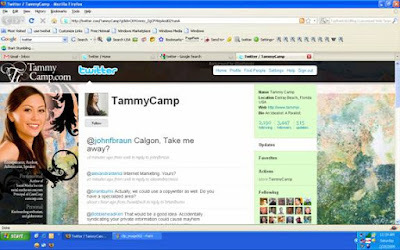 Google Search Screenshot for "Twitter"
Twitter Profile of Tammy Camp displaying paid advertisement.